Mortgage lenders require flood insurance for homes in designated flood plains, called Special Flood Hazard Areas (SFHAs). Lenders in some lower-risk areas may also require it. Even if you own your home outright or do not live in an SFHA, you may want to consider appropriate coverage. About 25% to 30% of federal flood insurance claims have been filed outside of SFHAs.6 The National Flood Insurance Program offers a lower-cost Preferred Risk Policy for coverage in areas with low to moderate risk. If you currently have flood insurance, this might be a good time to review your coverage to be sure it meets your current needs. Water damage to your home from a leaking pipe, a broken dishwasher, or a hole in your roof — water that comes from the top down — is typically covered by your homeowners insurance policy (up to your policy limits). However, damage from water that enters from the ground up is excluded from most homeowners policies and requires a separate flood insurance policy. Most flood coverage is provided under the National Flood Insurance Program either directly or from private insurance companies that work with the NFIP through a program called Write Your Own (WYO). An NFIP/WYO policy provides up to $250,000 in replacement cost coverage to rebuild the structure as it was before the damage, while possessions are covered for up to $100,000 of their actual cash value (replacement cost minus depreciation). Renters may purchase a policy that covers only their belongings. Private insurance companies may offer higher limits and/or coverage in areas where NFIP insurance is not available. A new ruling released by federal regulatory agencies in February 2019, effective July 1, 2019, provides more flexibility for lenders to accept policies issued by private insurers. To be considered a flood for insurance purposes, water must cover at least two acres or affect two properties. Typically, there is a 30-day waiting period before flood coverage goes into effect, so property owners should not wait until there is an imminent threat to buy flood insurance. Although floods caused by big storms, hurricanes, and raging rivers tend to get the headlines, floods may also result from other, more common factors, including blocked drainage systems, spring snow thaw, ice jams, and even a hard rain. The Federal Emergency Management Agency (FEMA) calculates the degree of risk in your community based on assessments of rainfall, topography, tidal surge, flood control measures, and other variables. Flood-hazard maps identify risk levels, depicting areas of high risk, moderate to low risk, or undetermined risk. Flood insurance premiums are based on the level of risk indicated on FEMA’s flood-hazard maps, along with other factors such as building elevation and age. As with most insurance policies, a higher deductible will generally reduce premiums. For a single-family home, a $5,000 deductible could reduce the base premium up to 25% over the standard $1,000 deductible, while the maximum $10,000 deductible option could save up to 40%.7 Of course, a high deductible may not be appropriate for some homeowners. To find out more about flood insurance and the risk in your area, including the appropriate flood-hazard map for your address, visit floodsmart.gov. For structures that have already been substantially or repeatedly damaged by flooding, most standard NFIP policies include up to $30,000 of Increased Cost of Compliance Coverage, which provides funding for elevating, moving, or demolishing the structure. Nonresidential properties are eligible for certain other floodproofing measures under the coverage. Government grants also may be available in some areas for flood mitigation. For more information on flood mitigation, download FEMA’s Homeowner’s Guide to Retrofitting at fema.gov/media-library/assets/documents/480. For structures that cannot be elevated, also see Reducing Flood Risk to Residential Buildings That Cannot Be Elevated at fema.gov/media-library/assets/documents/109669. 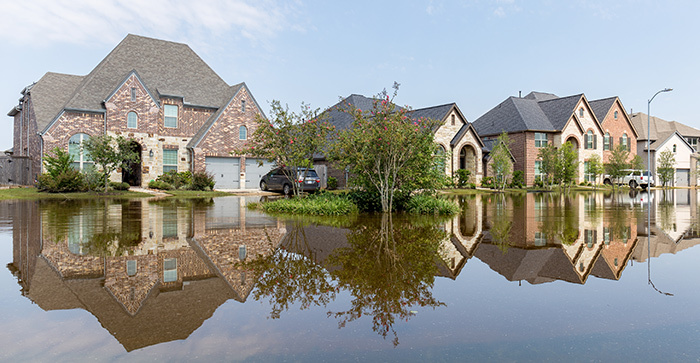 About four out of five flood insurance policyholders pay premiums based on the true risk of flooding in their area.10 However, many policies in the highest-risk areas have been subsidized by the federal government. Congress attempted to reduce these subsidies with the Biggert-Waters Flood Insurance Reform Act of 2012, but the law met strong resistance because it caused large premium increases for some homeowners. In response, Congress passed the Homeowner Flood Insurance Affordability Act of 2014, which became effective on April 1, 2015, and continues to regulate flood insurance through early 2019. This law prohibits annual premium increases of more than 18% and sets a target of making flood insurance coverage cost no more than 1% of the covered amount. The Act also reinstated “grandfathering” for older properties and ended a provision that removed a subsidy once a home was sold. Subsidies on most other properties are being phased out gradually, with 5% annual rate increases until they are charged the full risk rate. In order to help pay for subsidies as they are phased out, all policies are assessed a surcharge of $25 on flood insurance policies for a primary home and $250 on policies for second homes and nonresidential properties. Operating authority for the National Flood Insurance Program must be renewed periodically by Congress. Legislation signed on December 21, 2018, authorized the program through May 31, 2019. This was the tenth short-term “no-change” authorization since September 2017, a reflection of the challenges in finding consensus to make long-term changes to the program in the wake of the 2017 hurricanes. It’s likely that the NFIP will be reauthorized again, but it remains to be seen whether there will be changes to the program. If flood insurance is on your radar, you may want to monitor further developments.